Children love to forage and find all sorts of bits and pieces – feathers, rocks or paperclips rescued from the lip of the front loader washing machine, they’re all treasures to your little person. Now where does one keep the most precious of their finds? In their very own treasure box, of course! From the makers of Dear Little Letterbox comes the Dear Little Treasure Box, a wooden box perfectly sized to house the most treasured of possessions, from random garden finds to photos, awards and precious collections. 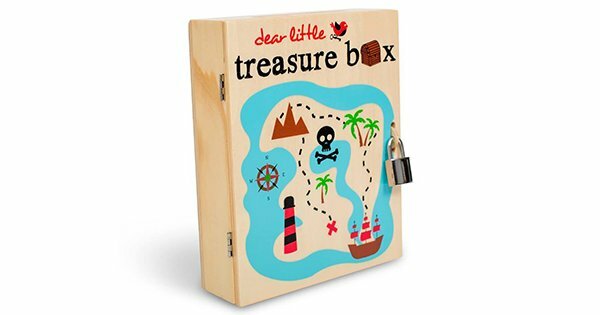 Dear Little Treasure Box includes a matching notebook, pen, stickers, even a lock and key to keep nosey siblings from potentially tampering with its contents. Dear Little Treasure Box is priced $48 and available direct from Dear Little Designs.